Leaf-Enclosed Coneflower is a shrub with stems 1-2 ft., much branched, rigid. Leaves are 5 x 3 cm, shortly tapering at both ends, conspicuously lineolate above; nerves 5-6 pair ; leaf-stalk 8 mm. 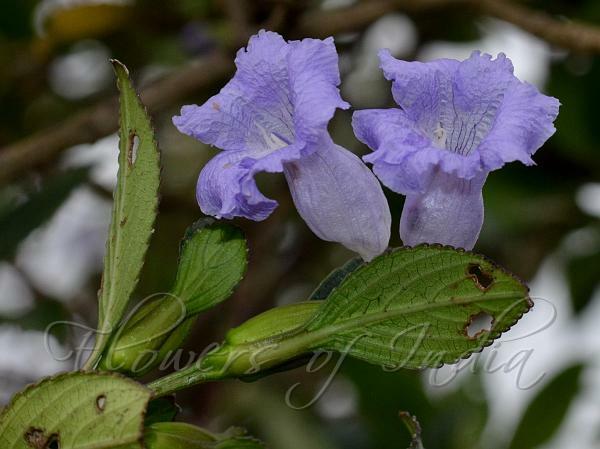 Flowers are borne in numerous heads, at branch-ends, about 1 cm, each closely sandwiched by two uppermost leaves. Bracts are 2 cm, linear-oblong, at first nearly hairless or hairy ; bracteoles 1.5 cm, linear, at first nearly hairless or hairy. Calyx is 2 cmlong, divided hardly half-way down, obscurely or prominently hairy at flower-time, hairy in fruit, segments narrowly lanceshaped. Flowers are 3 cm, blue or whiteish, hairless outside, hairy along 2 lines inside; linear base of the tube about as long as the suddenly widened swollen part. Capsule is 1.5 cm, 4-seeded. 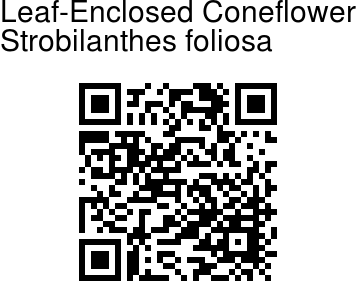 Leaf-Enclosed Coneflower is found in Southern Western Ghats. Identification credit: A.N. Sringeswara Photographed in Chikamagalur, Karnataka.